The lineups (starting pitchers, lineups and bullpens for MLB) are obtained online once published. If confirmed lineups are available (either obtained online, or the matchup has finished and lineups are available in the data update) the 'CONFIRMED' text is highlighted. For starting pitchers (MLB) the 'PROBABLE' text is highlighted once probable starting pitchers are confirmed (usually a few days beforehand). 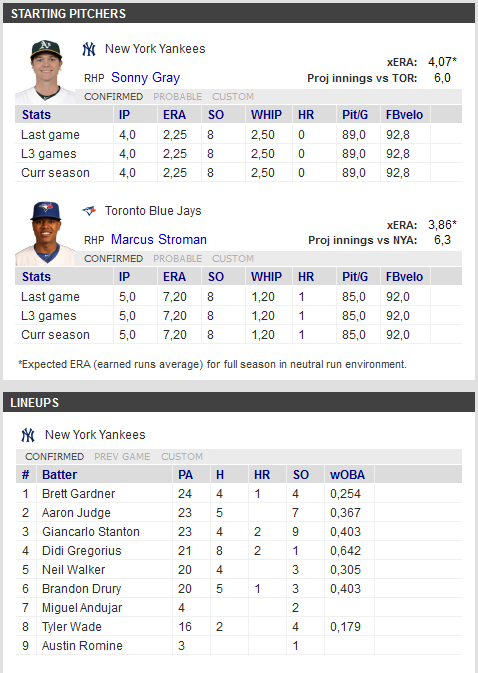 'PREV GAME' means the lineups are from previous game (for MLB matchups from previous game vs. same handed pitcher as current matchup), 'CUSTOM' means that the currently showed lineups has been modified by the user and 'DEFAULT' for MLB bullpens is the current set of relief pitchers (max. 7) on the 25-man roster. If a player is named MLB Batter, MLB Pitcher, NBA Player etc. it means, that the current player is not recognized by The Handicapper. League average numbers are used for projecting player value in these cases.